Larry Kay, a Los Angeles-based award-winning writer, is Leader of the Pack at Positively Woof, which celebrates the human-animal bond. 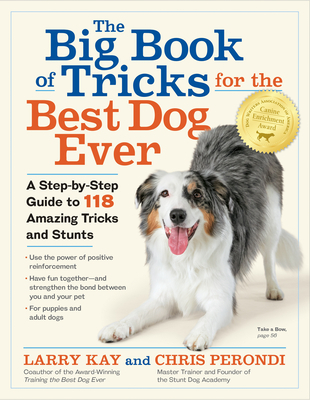 In addition to co-authoring Training the Best Dog Ever, he created the award-winning Animal Wow dog care DVD for kids. He has written for Dog Fancy magazine and AOL's Paw Nation. His writing credits include PBS documentaries, educational films for the New York City Board of Education, and children’s edutainment software for Disney and The Muppets. Larry Kay's website is positivelywoof.com. Chris Perondi runs Stunt Dog Productions and the Stunt Dog Academy near Stockton, California with his wife, Suhey, and their team of canine performers. They perform more than 1,000 shows every year across the country in venues like Dollywood, Six Flags, and Silver Dollar City in Branson, MO. They’ve been featured on The Today Show, The Ellen DeGeneres Show, The Oprah Winfrey Show, The Tonight Show with Jay Leno, and more. Chris Perondi's websites are stuntdogshow.com and stuntdogacademy.com.